IBM® Informix® Warehouse Accelerator is a state-of-the-art in-memory database that uses affordable innovations in memory and processor technology and trends in novel ways to boost query performance. It is a disruptive technology that changes how organizations provide analytics to its operational and historical data. 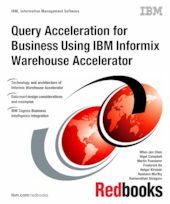 Informix Warehouse Accelerator uses columnar, in-memory approach to accelerate even the most complex warehouse and operational queries without application changes or tuning. This IBM Redbooks® publication provides a comprehensive look at the technology and architecture behind the system. It contains information about the tools, data synchronization, and query processing capabilities of Informix Warehouse Accelerator, and provides steps to implement data analysis by using Informix Warehouse Accelerator within an organization. This book is intended for IBM Business Partners and clients who are looking for low-cost solutions to boost data warehouse query performance.